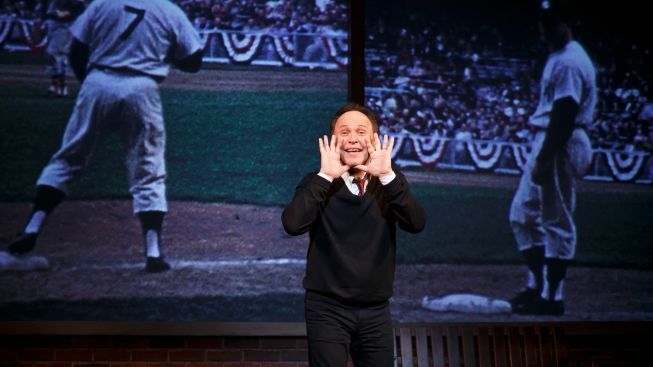 Billy Crystal might've been a Yankee if he hadn't gone into comedy. He's pictured here in "700 Sundays," which is back on Broadway for a limited engagement. It’s next to impossible to experience Billy Crystal’s still side-splitting “700 Sundays” without recalling the absurdist characters and hallmark moments of your own youth. The veteran entertainer, a city slicker-turned-awards-show-hosting-juggernaut, has turned the story of his own coming-of-age into such a relatable piece of theater that any one anecdote may start your waterworks flowing, even while you’re doubled over in laughter. Crystal’s paean to the good life growing up on Long Island was a tough ticket to find during its first run on Broadway starting in 2004, where it set a then-record for highest-weekly grossing non-musical in Broadway history. In a somewhat unusual move, Crystal has brought it back, this time to the Imperial Theatre, where it’s just opened for a nine-week engagement. Why the return? He’s feeling sentimental. This year marks a half-century since his father’s death. As a kid, Billy had only so many Sundays with his dad before Jack Crystal died of a sudden heart attack. Also this year, Billy turned 65, a milestone that occurred as his fourth grandchild came into the world. Age, of course, is just a number. “Sixty-five? Thpuh,” you can imagine Crystal spitting, with the same noise made by his Yiddish-speaking relatives when they talked through mouths full of sour cream. (Would that there was a Special Tony for Body Noise Emulation.) For a guy who can collect Social Security, the funnyman has the kinetic energy of men half his age, and it doesn’t relent for the two-plus hours he walks us through his adolescence before a mock facade of 549 East Park Ave., his childhood home. The comedy legend paints a mostly idealized portrait of his dad, a jazz promoter who owned the Commodore Music Store in Midtown. The jazz musicians Crystal met growing up made his African-American and Jewish social circles a wacky hodgepodge of “‘Hey, gimme five,’ and ‘Hey, you owe me five,’” he says. We come away seeing Jack as a hard-working man who fought hard for his family’s future. There are a few obvious updates to the material — an Obamacare joke here, a Rand Paul joke there — and the rare bit of schtick we’ve heard so much it could be excluded (“Every course at Kutsher’s came with its own whine …”). Jack Crystal kept an 8 mm camera and had the prescience to preserve an astonishing amount of color footage and still images (“Dad was the family archivist. … I mean, if I didn’t have these movies, I’d only have, like, half a show”), much of it displayed here via video screens on the house’s facade. “700 Sundays,” through Jan. 5, 2014 at the Imperial Theatre, 249 W. 45th St. Tickets: $97-162. Call 212-239-6200.